With over 8 million domain names served, HostGator is one of the most popular web hosting companies today. The Houston-based company has met with remarkable success, and has been able to keep its customers loyal with its superb service, cheap rates and secure experience along with a handful of useful features and tools that make hosting a website a piece of cake. 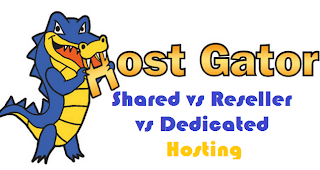 HostGator provides three major hosting plans; Shared, Dedicated and Reseller - all of whom serve different purposes. If you can't seem to decide between them, then this post will help you choose the best hosting plan that best suits your needs. The Shared hosting plan is technically designed for a single owner as it provides a single control panel for as many domains as you care to add. Also, because of its low price, it is the plan recommended for new websites. Some of the pros and cons of this feature are as follows. UNLIMITED sub-domains, FTP and Email accounts. Not efficient for multimedia streaming. Allows users to sell hosting. Each domain has a separate control panel. Limited bandwidth and disk space. HostGator also offers you to easily get your own server machines that you can use with your website. So, the need of this secondary channel in between is no more necessary. Dedicated hosting is also what most professionals recommend as the best of them all. Let’s take a look at its pros and cons. Control over the certificates with the Web Host Manager. Great bandwidth and disk space. More secure, reliable and trustable. Capacity increments – a hard step. Thanks for talking this matter. The above blog provides the basic information of different types of hosting plans .